What about best technologies by Cooper and Hunter powered by Gree? Cooper&Hunter International Corporation has introduced three series of ductless air conditioners and heat pumps for the USA, Canada and South America. Cooper&Hunter expanded its product line with Multi zone heat pump systems and Single zone ones. Innovative INVERTER technology G10 offers more cooling and heating capabilities. 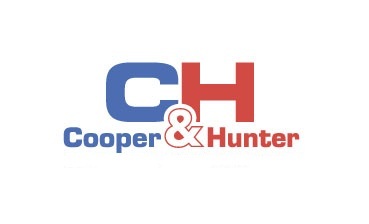 Cooper&Hunter ‘s high level of equipment reliability, unique characteristics, modern design make C&H products popular all over the world. 1) "FM" Series - is a Multi-Room Ductless Inverter Heat Pump Solution. C&H Multi systems, with an inverter technology, are some of today's most advanced ductless split heat pumps. Providing both cooling and heating comfort, in as many as nine separate zones, they are a perfect solution for many residential and light commercial applications. Multi systems reduce energy waste, maximize efficiency and achieve up to 22 SEER with our G-matric inverter driven compressors. Most importantly, the ultimate room comfort is generated with Eco-friendly R410A refrigerant. 2) "VICTORIA" Series - innovative ductless mini split solutions - wall mount heat pump. It is designed for Single Zone applications such as: bedrooms, living rooms, dining rooms, home offices, sunrooms, basements, computer / server rooms. You may keep your home comfortable easily with a Cooper&Hunter VICTORIA air conditioner. Your economy is up to 23 SEER. 3) "ALICE" Series - DC Inverter-driven ductless split systems offer superior performance, energy-efficiency, and comfort in stylish solutions conforming to all interior spaces and lifestyles. A broad array of models allows the perfect match of style and performance to any interior space. It’s up to 16 SEER. Compact & Quiet design. More information is available at cooperandhunter.us and at comfortside.com (exclusive representative in USA). Cooper&Hunter is also on Facebook, Twitter, and YouTube. Since 2003, COOPER&HUNTER equipment has become very popular all over the world. The number of products yielded under the brand C&H (COOPER & HUNTER) is measuring in millions of items now and the C&H itself has become a mark of quality and reliability of HVAC equipment. The company’s goal has always been to give the customers the best quality air conditioners for an affordable price. Cooper&Hunter US, COOPER AND HUNTER INTERNATIONAL CORPORATION, is headquartered in Miami, Florida. Cooper&Hunter is a leading marketer of ductless split systems and variable HVAC equipment in Europe and now develops its retail activity in the USA. (USPTO / United States Patent & Trademark Office / N 4494682). Join in and write your own page! It's easy to do. How? Simply click here to return to Share Your Air Conditioning Experience.